Bandage scissors are essential equipment for nurses working in the ER department, surgery, or orthopedic wards. But only the best bandage scissors will be able to cut through fabrics and bandages like a knife through melted butter. If you want to save yourself the frustration of spending ages trying to remove a bandage, check out the selection of scissors in this guide. Made from surgical stainless steel, these scissors impress with their milled serrations designed to rip through most materials. You can use them to cut off bandages but also garments if you’re working in the ER ward. The injection molded handles ensure ergonomic maneuvering, while the standard hospital size makes them ideal for all purposes. These shears come in multiple colors you can match with your personality or scrub. They are also meant to last for a long time and are autoclavable, so you can properly sanitize them after each use. A cheap solution for all nurses shopping on a budget, the BONTIME Stainless Steel Bandage Scissors are a great alternative to our top pick. These scissors come in a set of two and respect the quality and standards you could expect from a medical instrument. Their main feature is the extreme performance given by the environmentally-safe stainless steel blades. Treated with a black titanium coating and boasting anti-rust properties, these instruments are safe to use in all clinical settings. The coating also maintains the blades sharp for longer, helping you rip through bandages and garments with incredible ease. Another thing that stands out is the ergonomic design that promotes maneuverability and handling ease. Moreover, the bent tip and blunted edge also respect medical standards, helping you cut bandages or clothing quickly and safely. Each scissor in this set has an attractive color that is different from the usual black, and they come backed up by a 2-year worry-free warranty. Respecting the standard size of the ER bandage scissors, the First Lifesaver Titanium Coated Medical Scissors are ideal for all healthcare workers in the ER or wound wards. These are made from Japanese stainless steel and boast titanium coating that protects the blades from corrosion and rust. 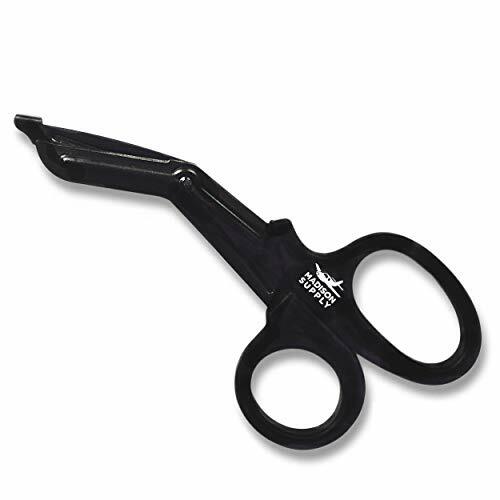 Like most paramedic shears, these scissors have a serrated lower edge designed to cut through thick bandages, jeans, and even leather quickly and effortlessly. Designed for maximum control, these scissors also have soft-grip, non-slip contoured handles that are easy to hold even when wet. As you can expect, patient safety is ensured by the rounded tip and clothing lift lip; the scissors are also autoclavable and easy to maintain clean and sanitized. The Opoway Bandage Scissors Pen Lights is a high-value kit for all nurses in emergency wards. It comes with a pair of sturdy and functional standard-size scissors and two pupil penlights. All items included in the kit impress with outstanding quality. The scissors are made from quality stainless steel and have an ergonomically-designed non-slip handle. Measuring 7.5 inches, they are ideal for cutting through most materials. The bent and round head design help you cut bandages and clothes in all safety. The only thing we don’t like is the lack of a serrated edge, that would have helped to rip through tougher materials with more ease. Regarding the penlights, they come with included batteries and a convenient pupil gauge and ruler chart printed on their side. They are perfect for checking vital signs in patients with trauma and make a nice addition to your ER kit. Boasting great quality and comprising all you need to use all items right out of the box, this kit of scissors and pen lights delivers exceptional value for money. The last on our list of the best bandage scissors for nurses, the Cynamed Lister Bandage Scissors are more useful to those working on general wards. The set comprises two Lister bandage scissors, a standard 7.5-inch and a smaller 5.5-inch one. Both come in handy on all those moments when you have to remove thin bandages, such as for checking a wound or the progress of a surgical incision. Besides the scissors, you will also get two hemostat forceps, which are ideal for nurses in theaters. All instruments included in the kit are made from high-quality stainless steel protected by a rainbow-colored titanium coating. They resist rust and corrosion, and are also autoclavable, for a safe and sanitized hospital use. Getting a pair of scissors could seem uncomplicated at first. That is until you find that not all bandage scissors were created equal. Not only they come in different types, but there are also a few important things to consider to make sure you get the right product. Bandage scissors are typically divided into two categories, based on their size and intended use. Lister bandage scissors: Also called bandage forceps or angle tipped scissors, are a type of medical scissors characterized by an angled shape and a blunt, rounded tip on the bottom blade designed to lift the bandage and cut it without damaging the skin. They are usually 7.5-inch long but have a slim profile and thin blades that can handle thinner bandages and fabrics. Trauma shears: Have an almost identical configuration to the Lister bandage scissors, but they have a chunkier profile and are designed to cut through most materials. The main difference between the two, besides the obvious size, is the presence of a serrated edge on the lower blade. This edge can rip through almost anything, from thick bandages to jeans, leather, and even car belts. They are also 7.5 inches long but serve a heavier duty purpose on emergency wards or ER mobile units. Regardless of which bandage scissors you need, there are a few essential features to have in mind before deciding which model is the best. Materials: Bandage scissors must be sharp enough to cut easily through all materials. This requirement is especially important in emergency situations when your patient’s life could depend on how fast you can remove their garments. Japanese stainless steel is the best material, although sharp stainless steel, in general, could also be a great alternative. Design: All bandage scissors must have the same design. They must have a slightly pointed upper blade and a blunt lower blade with a rounded tip. The lower blade is designed to lift the bandage or garment and prevent injuries while you’re cutting. A serrated edge is essential if you want to cut faster through thicker materials. Size: The standard size of bandage scissors is 7.5 inches. At this size, the scissors are comfortable to hold by an adult, and you can maneuver them easily. Smaller scissors may be needed for small bandages or pediatric patients though. Anti-rust properties: You will often use your bandage scissors in less than ideal conditions, so it’s necessary to invest in a pair that resists rust and corrosion. The best bandage scissors for nurses are coated with titanium, a hypoallergenic material capable of maintaining the blades sharp for longer and of preventing the corrosive action of bodily fluids or water that may come in contact with your instrument. Autoclaving resistance: Bandage scissors, like all medical equipment, must be sterilized after use. It is essential, therefore, to invest in a pair of scissors that can withstand autoclaving. During this process, the scissors will be exposed to pressured steam at 250°F for at least 15 minutes, and poor quality material will quickly lose its sharpness or get rusty.